Major Bartlomiej Beniowski is a shadowy figure in the history of Chartism. But new research sheds light on the emigre cavalry officer who might have been Chartism’s great military leader but made a living as a writer and lecturer on memory techniques. 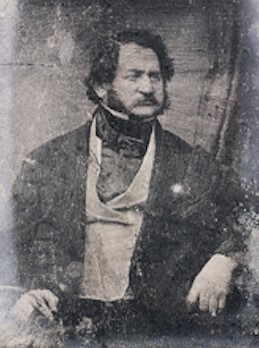 The picture of Bartlomiej Beniowski shown here is reproduced from an original stereoscopic tinted daguerreotype held as part of a collection of daguerreotypes at the National Museum of Lithuania. It appears here with the kind permission of the museum. The entire picture is shown below. In the aftermath of the Chartist rising at Newport and amid rumours of a possible armed rebellion in London and across the North of England in the winter of 1839-1840, one name constantly recurred: that of a mysterious Major Beniowski. It was said that he served on a five-strong secret war committee planning and directing Chartist military operations, that he had been despatched to take command of South Wales in the event that the Newport rising succeeded, and that he was in the North of England fomenting revolution and again ready to seize control. There were reports that he had been sent from London to Newport with 138lb of ball-cartridge, prompting the mayor to ask the Home Office to send someone who would recognise Beniowski so that he could be apprehended. A former diplomat and Russophobe Tory politician named David Urquhart even alleged that Beniowski was a Czarist secret agent and that the Russian navy was on standby to support a Chartist rebellion – a singularly unlikely claim given Beniowski’s personal history and the subsequent political activities of his family. Beniowski had started life as a subject of the Czar. Born around 1800 into a Jewish family in in Grodno, now in Belarus and close to the borders of Poland and Lithuania, but then part of the Russian empire, he was educated at the University of Wilno (now Vilnius in Lithuania). Beniowski himself later claimed to have studied a diverse range of subjects before turning to medicine. According to an account of his life first published in the Jewish Socialist magazine, after graduating he joined the Russian Army’s Lithuanian Corps as a medical officer. In November 1830, Polish officers rose up in a rebellion that flared into a serious revolutionary war, during which Beniowski, who had been deployed as part of the Russian army, is said to have switched sides at the battle of Kuflew on 25 April 1831, joining the vastly outnumbered Polish rebel forces. Beniowski became an officer in the Polish lancers, but after Russia defeated the Poles he was one of many who left the country, moving to Paris and subsequently, in 1836, to London. His promotion to the rank of major was confirmed by the Polish and Lithuanian army chief in exile Jozef Dwernicki’o. A fragment of the original document survives and is held by the National Museum of Lithuania. On his arrival in England, Beniowski joined the London Democratic Association, founded in January 1837, first as the East London Democratic Association, and rapidly to become a more radical voice of Chartism in the capital than that of the mainstream London Working Men’s Association. Although Beniowski was to join the LWMA too, it was through the LDA that he found his political voice. Beniowski brought experience of soldiering to Chartism that most radicals lacked. By May 1839, he was to be found writing articles for the London Democrat newspaper commenting on military tactics (cited by Jennifer Bennett in Chartist Experience: Studies in Working Class Radicalism and Culture, 1830-60). Indeed, during the course of 1839, his name would become a familiar one to readers of the Chartist press, with accounts of his speeches appearing frequently in The Charter, the Northern Star and other papers. The precise role Beniowski played over the winter of 1839-1840 may never be known. However, in unravelling the larger issue of who knew what and when about the rising in Newport and planned risings elsewhere, the historian Professor Malcolm Chase sheds considerable light on the issue. In Chartism: A New History, Professor Chase is sceptical about the claims of the Alexander Somerville to have met the secret Chartist “Committee of War”, whose members, he said, included Beniowski, and to have turned down a role as military adviser. Somerville, he writes, was “a self-serving patriotic journalist with a knack of getting things half right”. However, he gives more credence to Urquhart’s account of a meeting with William Cardo, a delegate to the Chartist convention, who told Urquhart that a “Polish emigrant” was to take command of the Chartist forces in the Welsh mountains following a rising “in the long nights before Christmas”. These preparations, however, were not about the co-ordination of a widespread rebellion to coincide with Newport, but as a response to the arrest of the Newport leaders in the days and weeks after it, when there were very real fears that they would be executed for high treason. Professor Chase notes that Beniowski was one of a number of leading Chartists spotted in Wales in mid November 1839, barely a fortnight after Newport. Later that month he addressed a meeting at Bethnal Green Trades Hall at which there was open discussion of a general rising if the Newport men were executed. And he was a delegate at a small, ad hoc London convention in December to decide how to best respond to the arrest and sentencing of the Newport men. There is also evidence that preparations were being made for widespread uprisings across the country, with caltrops and fireballs being manufactured in Sheffield and Nottingham, panicked reports from magistrates about their areas, and the publication a new edition of Defensive Instructions for the People – a guide to training militia recruits which some Chartists took as their military handbook. Feargus O’Connor appears to have gone out of his way to avoid knowing anything of the arrangements that were being made, but while he was waiting for Frost to go on trial, a delegation called on him, and came away firmly believing that he was ready to fight if need be. O’Connor later denied this had been the case. In a long and rambling self-justification published some time later under the heading “The destroyer of Frost discovered”, O’Connor claimed that not long after meeting the delegation, a member of the LWMA called Henry Ross had been sent to tell O’Connor “that Major Beniowski was to be appointed the commander-in-chief, as he was a good officer; and as soon as the battle was fought and won, that then Beniowski, as he was a dangerous and ambitious man, was to be shot” (Northern Star, 3 May 1845). In the event, the initial sentence that Frost and his Newport colleagues should be hanged, drawn and quartered was commuted to transportation and there was no rising. Beniowski was not called upon to lead a revolution, and as the first wave of Chartism receded, little more was heard of him in this capacity. The accusations that Beniowski was a Russian spy, however, continued to find a ready audience. Émigré politics have a reputation for internecine fights. None more so than among the small Polish community in London in the 1830s, and some of the mud thrown at Beniowski by Urquhart and his informants clearly stuck – notwithstanding that Urquhart levelled similar accusations against the Foreign Secretary, Lord Palmerston, whom he claimed was a traitor in the pay of Russia. One widely reprinted newspaper report gave a bemused account of the outbreak of violence that ensued when it was proposed that “a General or Major Beniowsky take the chair” at a meeting of the Friends of Poland (see for example, Morning Chronicle, 3 June 1839). London Chartists stood by Beniowski, and when prime minister Lord John Russell struck his name off a list of Polish exiles receiving a regular grant from the government, they rallied round to raise a few pounds for him (The Charter, 7 July 1839). But the stories continued to circulate, with the Irish leader Daniel O’Connell making little attempt to veil the accusation when he referred in Parliament to Beniowski as being “believed to be actuated by mercenary motives, and to be attached to another Government” (Morning Post, 8 August 1839). The accusation would be repeated more robustly by the former London Democrat Cardo at a public meeting in Carlisle. Cardo had been impressed by Urquhart at their meeting the previous year, and now denounced Beniowski by name as “a hired spy of the Russians”. (Carlisle Journal, 29 August 1840). He would expand on these claims at a later meeting in Newcastle, adding accounts of Beniowski’s role in the Newport affair and his alleged “betrayal” of London Chartists to the police. Writing to the Chartist Northern Liberator (21 November 1840) an angry Beniowski rejected the charges and pointed out that he had not met Cardo since before the Newport rising. The accusations, it appeared, would not go away – but neither did they gain traction with the wider Chartist body. Some years later, on 11 August 1845, Beniowski was a guest at a “democratic supper” held in the Angel Inn on Blackfriar’s Road to celebrate the formation of the old London Democratic Association. Calling him to speak, George Julian Harney referred to Beniowski as an “old friend” who had been “caluminated and suffered terrible persecution” – no doubt a reference which would have been easily understood by his audience (Northern Star, 16 August 1845). But Urquhart would not give up. In 1847, at a meeting on Poland at the Freemasons’ Tavern, he repeated his accusation that Beniowski was a “spy” once too often. As he left the meeting, Beniowski confronted him and in the scuffle that followed, Urquhart received lacerations to his face which, Beniowski insisted, were accidentally caused by his rings or the buttons on his coat (Morning Advertiser, 4 March 1847). Beniowski was convicted of assault. Sentencing at a later date, the judge conceded that Beniowski had suffered very great provocation by Urquhart, who claimed never to have previously met the man he had pursued so relentlessly for the best part of a decade. But the judge added that Beniowski should have gone to law to protect his reputation rather than taking matters in his own hands. Beniowski was lucky to escape a prison sentence, pleading that time in gaol would cost him his business, but was fined £50 and ordered to find sureties for his behaviour (The Examiner, 24 April 1847). So where had Beniowski retreated during the early 1840s? As the excitement over Chartism had died down, Beniowski had turned his hand to new ventures. He appears to have had a deep interest in language. He wrote books arguing for a rational reform of English spelling and word usage. He developed a mnemonic system which he called “phrenotypics” to memorise large amounts of information, which he unveiled at a lecture on “the wonders of artificial memory” in 1841. And he invented what appears to have been an early form of typesetting machine. In one of a number of books he published in the 1840s, a highly eccentric work with the title The Anti Absurd or Phrenotypic Alphabet and Orthography for the English Language, he set out his education and experiences to date, listing “seven years of mathematical, literary and medical studies, at the University of Wilno”, “about ten years of medical practice – of authorized, official, medical practice”, “a course of military studies” at the Ecole d’Etat Major in Paris, and “about twelve years of travelling in various countries of Europe, Asia, and Africa”, during which he had learned 12 modern and ancient languages and played “some part or other in the principal political movements of Europe, from 1816 to 1841, at St Petersburgh, Wilno, Warsaw, Cairo, Paris and London”. Copies of Beniowski’s lecture were available price 6d, while a full course of six classes “for gentlemen and ladies” wanting to learn the technique cost one guinea. Working men could take the same classes for 10 shillings. In 1853, Beniowski registered patents for a new type compositing machine, which would create blocks of type rather than using single letters. The operation of such a machine, he claimed, could be easily learned, and would open up employment in the industry to women. He clearly hoped this invention would make his fortune, and when he set up his Patent Printing Machinery and Printing Company, a number of MPs and other prominent figures appeared to back the initiative (Morning Chronicle, 22 August 1853). There was continued interest in the scheme for some years afterwards, but ultimately it appears to have come to nothing. Beniowski also continued to address meetings on the Polish cause and in aid of Polish refugees, sharing a platform with the Italian revolutionary leader Giuseppe Mazzini (Morning Advertiser, 28 February 1843). He later spoke at a meeting of Polish exiles in Paris, delivering a speech which, though given in Polish, was described by a newspaper as “truly English” (Morning Advertiser, 4 April 1861). Beniowski’s application to become a British subject. In 1854, the man who had once been thought ready to overthrow the British government by force of arms himself became a British subject. His naturalisation papers survive in the National Archives (Class HO 1; Piece: 57/1868). He also appears to have travelled abroad regularly. His name appears in the index of passport applications for the years 1854, 1855, 1856 and 1859. But did he pay at least one return visit to his native land? A ship’s list of 24 August 1859 records his arrival in Dover from Ostend as one of 12 “alien” passengers on board the Emeraude. Under the heading “Country”, it lists “Russia” (National Archives Class: HO 3; Piece: 99). This may, however, simply indicate Beniowski’s birthplace. As each passenger’s entry is in a different hand, it is likely that Beniowski signed his own name (below). Major Bartlomiej Beniowski entry among the list of alien passengers on the Emeraude. Beniowski’s entry among the list of alien passengers on the Emeraude. Beniowski died at his home in Bow Street on 28 March 1867, having lived at the same address for more than a quarter of a century. His death was notified by Edward Harris, also of 8 Bow Street, who had been present at the death, the causes of which were recorded as influenza and fatty degeneration of the heart. Beniowski’s occupation was given as “Major in Polish Army”. However, his age was wrongly recorded as 76 years. Beniowski’s estate amounted to less than £50, and on 17 July that year administration was granted to “Emilja Wrublewska (wife of Eustache Wrublewski) of 8 Bow-street aforesaid the Daughter and only Next of Kin of the said deceased”. His family, however, would go on to play a significant part in the cultural history of Lithuania and Poland. Emilja Wrublewska (1830-1886) left behind a legacy of literary works, including translations, poems and summaries of scientific and other material. Intriguingly, she kept a diary from 1850 onwards which may hold further material about her father. This remains to be translated. Another relative, Walery Antoni Wroblewski, her husband’s nephew and ward, served as an officer in the Polish-Lithuanian uprising of 1863 and in 1871 went on to command units fighting to defend the Paris Commune. Emilja’s son Tadeusz Stanisław Wroblewski (1858-1925) would become an important reformist politician, bibliophile and cultural activist in Vilnius. The library of Lithuanian Academy of Science carries his name today. Some information for this biography has been taken from an article which first appeared in Jewish Socialist magazine in 1995 and can now be found on the Historical Passages blog. Unfortunately, the article lacks references and I believe the author has since died. Among the issues which I have so far been unable to verify are: the suggestion that Beniowski was Jewish; and the claim that he defected to the rebels at the Battle of Kuflew on 25 April 1831. Finally, there are differences between the Polish and Lithuanian versions of proper names – both of places and people. I speak neither and in looking at some material have not been sure which version has been used. Neither do I know whether Beniowski’s daughter kept her diaries in Polish or Lithuanian. Beniowski himself was often referred to as Polish during his lifetime and he spoke Polish (along with many other languages), but if pressed is that how he would have seen himself? Although we now have a picture of the major to go on, there remains much about his life which is a mystery.